Harwich Town Council has the privilege of being permitted to elect a Town Mayor, a long-standing tradition originally granted by Royal Charter in 1604. The Mayor is elected annually at the Annual Statutory Mayor Making Meeting held in May. The election of Mayor is the first item of business on the agenda and he or she remains in office until immediately after the election of their successor at the next year’s annual meeting. The Mayor holds two roles – one as Chairman of the Town Council where their duties are set by local government legislation and the other as Civic Ambassador for the town. Under statutory legislation the Mayor must be a serving councillor. The Mayor also serves as an Ex Officio member on all of the council’s committees holding normal voting rights. The Mayor may also be selected to sit on Working Parties as arranged by the council. The Mayor wears the civic regalia when attending functions in the capacity of Mayor; either the full Chains of Office or the Mayor’s badge, whichever is appropriate. 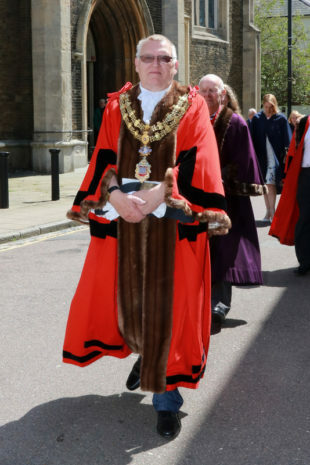 The Mayor’s robes are only worn during the four civic occasions in the local calendar – Mayor Making, Trinity Sunday, Merchant Navy Day and Remembrance Sunday. As Civic Ambassador the Mayor is the public face of the council and represents the parish of Harwich & Dovercourt. During their year of office the Mayor will be invited to attend many events, both within and outside of the parish and these invitations invariably include requests to open school fetes and sporting events as well as attending civic services and receptions in neighbouring towns within the district. All invitations for the Mayor and Mayoress’ attendance at events are to be forwarded to the Assistant Clerk to the Council, in good time. Please be aware that submitting this form does not guarantee that the Mayor will be able to attend – attendance will be subject to confirmation at a later date.